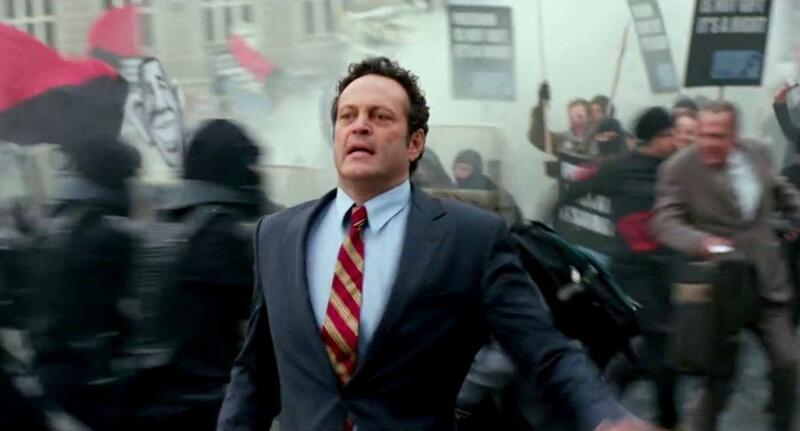 Ten years ago, Vince Vaughn peaked as a comedic actor with “Wedding Crashers,” subsequent to several other memorable roles in “Swingers,” “Old School,” and “Dodgeball: A True Underdog Story.” Then he made “Fred Claus,” “Four Christmases,” “Couples Retreat,” “The Watch,” “The Dilemma,” “The Internship,” and “Delivery Man.” Did I miss any other stinkers? Oh well, you get the point. What happened to Vaughn? Is he incapable of saying no to a script or is he just not as funny as we built him up as? Vaughn can still salvage his comedy career with a well-written role in a smart movie. Ken Scott’s “Unfinished Business” isn’t that movie. Just get a load of the character Vaughn’s saddled with playing. He’s Dan Trunkman, a workaholic who doesn’t get to spend as much time as he’d like with his family. Oh yeah, because we haven’t seen that archetype in a million other comedies! After quitting his job, Dan sets out to start his own business. The only employees he manages to attract are an elderly worker named Timothy McWinters (Tom Wilkinson) and a smiling idiot named Mike Pancake (Dave Franco). Hopefully you find Mike’s last name hilarious because it provides the basis of several jokes. Walking out of this movie, you likely won’t remember exactly what line of business these businessmen are supposed to be in. Maybe they’re just like President Business from “The LEGO Movie.” Their occupation is really just an excuse to send them on a business trip to Europe. Oh yeah, because we haven’t seen a million other comedies set in Europe!! It’d be one thing if this premise amounted to a lot of hilarious exploits, but most of the gags just meander with nowhere to go. The setups are there, such as when Dan is put on display at a museum. The filmmakers never deliver with a punch line, though. There are more plugs for Pepsi and Dunkin’ Donuts here than there are laughs. Vaughn is merely going through the motions, probably saving his A-game for the second season of “True Detective.” Wilkinson looks like he’d rather be doing the sequel to “The Best Exotic Marigold Hotel” than this dreck. The only one who brings something fun to the table is Franco, who’s done solid supporting work in recent years and can pull off a dead-on Robert De Niro impression. He scores a few good chuckles as a stuttering fool with a heart of gold. Even he starts to get old after awhile, however, which is the case with most one-dimensionally dimwitted characters. I’d be one thing if “Unfinished Business” simply wasn’t funny, but the audience is also forced to sit through some shamelessly sentimental scenes involving Dan’s family. Although it has nothing to do with the rest of the movie, Steve Conrad’s script incorporates a subplot concerning cyber bullying and the effects it has on kids. While its heart is in the right place, this material feels tacked on, manipulative, and uneven with some of the film’s raunchier moments. A comedy can be heartfelt and raunchy. “Unfinished Business” isn’t either in any of the right ways, though. Nick Spake is a graduate of Arizona State University. He has been working as a film critic for the past ten years, reviewing movies on his website,NickPicksFlicks.com.